The orchids make up a huge family of plants found throughout the world, but most species grow in tropical rainforests as epiphytes – plants that grow on other plants rather than in the ground. Prized for their unusual and often spectacular blooms, orchids inspire almost fanatical devotion among specialist growers and hobbyists, and are hugely important in the floriculture industry. 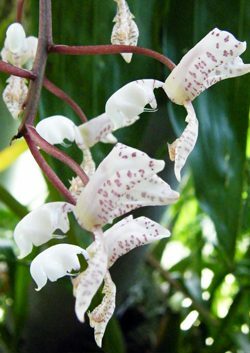 Did you know that vanilla is made from the fermented seed pod of an orchid?